A Heart space from the Mexico City CBRE office is pictured above. For decades a symbol of achievement in the working world has included securing the coveted corner office. However, what leading workplace strategy experts have now realized is that the four walls many organizations use to surround their employees could actually be stifling innovation, inhibiting collaboration and preventing the sense of community most companies strive to build. The history of office environments in America is an interesting story of workplace evolution. The open office environment so trendy today was actually the norm in the 1950s and 1960s, according to Neil Howe in Forbes, “Open Offices Back in Vogue – Thanks to the Millennials” (March 31, 2015). It was the introduction of the cubicle in 1968 that changed everything, and that movement continued well into the 1990s with cubicle sales growing 20-fold between 1977 and 1997 (Howe, Forbes, March 31, 2015). While today’s workforce may be rising up en masse in favor of tearing down cubicle walls, CBRE’s Workplace Strategy experts advocate for balance – a workplace that builds a sense of community by understanding the need for private areas while also embracing the innovation, collaboration and efficiency driven by open, shared space. According to CBRE’s Americas Occupier Survey, workplace strategy is increasingly being viewed as both a critical employee attraction and retention strategy (57 percent) and as a means to control costs. 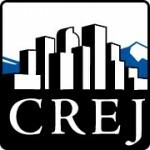 This month, CBRE will open a new regional office in downtown Denver, which will showcase its global initiative called Workplace360 – our approach to workplace strategy designed to promote flexibility, mobility and productivity. Although we are not moving far from our current location in terms of distance, the new office represents a work experience that is a far departure from the prototypical office environment. While there are a number of ways our new space facilitates and sustains a spirit of community throughout our organization, there are three that we find elicit the most interest from our clients who are considering their own workplace strategy initiatives. Free addressing means employees no longer have assigned desks or private offices; instead they are free to choose where they sit each day, allowing them to cater their workspace to their schedule and tasks at hand. The system also is a tool for space efficiency, as it allows companies to occupy space in a way that is truly equal to the number of employees who are showing up any given day. Of the 229 corporate executives who participated in CBRE’s Americas Occupier Survey, 85 percent cited space efficiency and restructuring as a top strategy for reducing occupancy costs. Free addressing creates “dynamic density,” representing the highest amount of space being consistently used in a way that enables each employee to work at his or her highest potential. Our free-address system is made possible by the use of enhanced technology that allows employees to easily move within the office, as well as new audio-visual capabilities, which facilitate working internally with co-workers and presenting externally to clients throughout the space. Historically, a collaborative space in an office translates to a traditional, closed-door meeting room. However, according to CBRE’s 2015 Space Utilization research report, the United States average meeting room utilization is only 24.5 percent, the lowest of all countries studied. In the same study, two- to three-person meetings were observed to make up 59 percent of all meetings, however, the most common meeting room size was a six-person room. 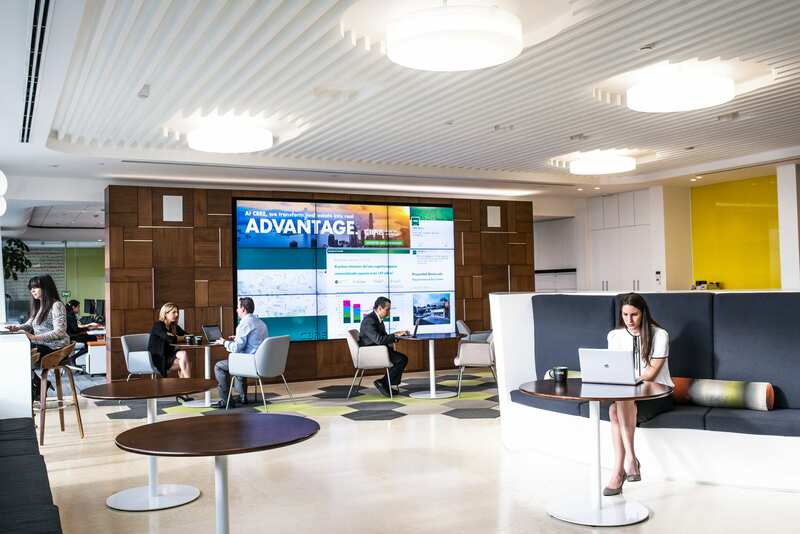 CBRE’s Workplace Strategy experts say the best approach is to provide a range of options that consider size, layout and function. In our new downtown Denver space, employees will be able to choose from everything, including small, private huddle rooms where two to three can gather around multiple screens to large, open areas perfect for a team meeting or brainstorm. We have even elected to convert all four corners of the office into collaborative spaces, which were previously home to private offices. In this way, the largest number of people can enjoy the natural light and stunning Colorado views on a daily basis. Investing in space choice and flexibility means two things: First, employees are empowered to select the space that best meets their needs; and second, collaboration is maximized by making it easier than ever before to bring people together. In a recent survey of employees currently working in CBRE Workplace360 spaces, 94 percent indicated they are more easily able to collaborate in the new environment. The Heart is the central hub of the office, acting as both a meeting place and also a social place for employees and guests. It’s an amenity-rich environment, more reminiscent of a hotel lobby than a traditional office reception area. With comfortable seating, a bar and coffee area as well as places to plug in a laptop or engage in an interactive presentation, the Heart offers opportunity to create a place of energy and excitement within the office. More than any other aspect of our new space, the Heart is fundamental to building a sense of community in our office. It is within this area where spontaneous, cross-business-unit interactions will drive innovation day in and day out. Research has shown the more an organization can bring its individual professionals together to build relationships within the team, the better as a whole the company will be. According to a Workforce MOODTracker Fall 2014 report, the more peer relationships we have at work, the more engaged and committed we become to our companies (“The Effect of Work Relationships on Organizational Culture and Commitment”). In the end, a community-focused, culture-forward working environment really comes down to a sense of place – which is ultimately decided by the people who walk in your doors each day. By committing to an office that empowers employee choice, enhances collaboration and promotes employee relationship building, we are investing in the asset that has the greatest impact on propelling our business forward – our employees.